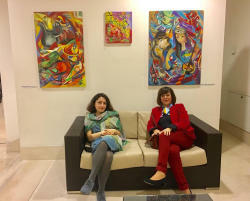 Works of Azerbaijani artists have been presented at the international exhibition in Milan, Italy. 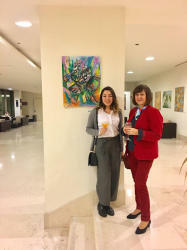 More than 50 paintings by Asmar Narimanbayova, Rena Amrahova, Vafa Efedizade-Tezjan, Aysel Mirgasimova, Azer Aliyev, Aysel Badalova, Fidan Akhundova, Arif Amirov, Lala Agayeva, Aysel Amirova, Fatima Garibli, and Jamali Rahmanli decorate the walls of Expo Fiera Gallery. 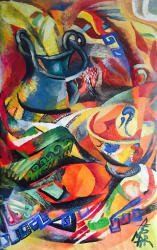 Most of the presented works features Azerbaijan’s national motives and beautiful landscapes. 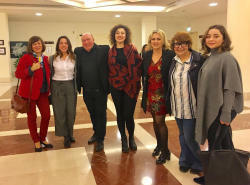 The exhibition held under the title “Colors without Borders”, brought together talented artists from Azerbaijan, Italy, Turkey and Georgia, Trend Life reported. 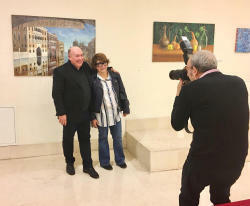 Famous art critic, Prof. Gianluigi Guarneri and the gallery curator Helena Ferrari attended the event. They stressed the vibrant palette in artists works. 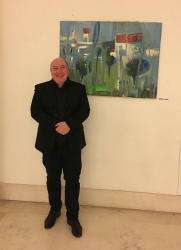 The exhibition will last until March 22. Asmar Narimanbayova is the founder of Association de Togrul Narimanbayov. 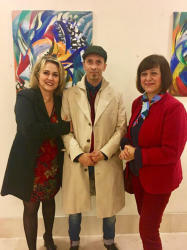 The objective of the association operating in France is to ensure cultural exchange between artists of different countries, as well as organize art exhibitions. 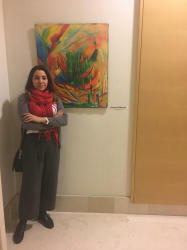 She is the daughter of famous painter, Togrul Narimanbayov and talented sculptor artist, Elmira Guseynova, who was the winner of a State Prize of the USSR and Azerbaijan, and the People's Artist of USSR. 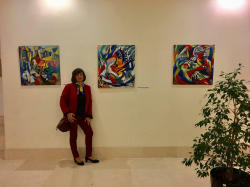 The artist's works are featured in many prestigious galleries and museums not only in Azerbaijan, but also in America, France, Germany, Poland, Russia, Switzerland, United Kingdom, Finland, and China. Asmar Narimanbayova is is an associate professor of Azerbaijan State Academy of Fine Arts, and a member of the presidium of the Azerbaijan Union of Artists. 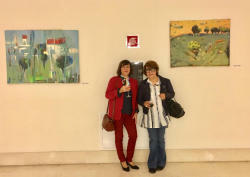 The exhibition was arranged within the 19th “Art Shopping” festival. 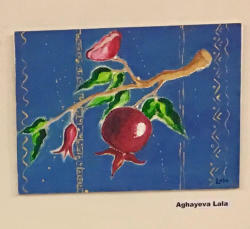 Aysel Badalova is a young artist who works in different styles and techniques. 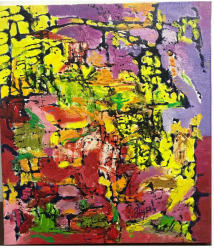 Her works stand out in bright colors, through which she is trying to convey the mood of warmth to her paintings. During the creation of a new work, she mainly listens to her thoughts and feelings, that's why the key factors for starting a successful work for her are mood and atmosphere. The inspiration for her is such things as traveling, which she calls the second passion: exploring new places, meeting new people. Most of her time, Aysel spend in the studio, it brings her a lot of joy, which is important to convey feelings on canvas. 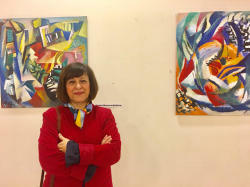 She often participates in various creative events and exhibitions, and help to create them. Young and talented artist Jamali Rahmanli presented her works at the second International Festival of Contemporary Art "French Riviera" in 2017. She also hold lecture "Inspiration of a Wanderer" in Nur Art House last year.